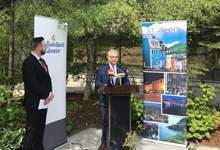 This morning, the Honourable Andrew Parsons, Minister of Municipal Affairs and Environment, was joined by Danny Breen, Mayor of the City of St. John’s, to announce over $46 million for municipal infrastructure projects in the city. The Multi-Year Capital Works program is part of the Provincial Government’s 2017-2020 municipal infrastructure program. The program provides $100 million over three years to support the development of municipal infrastructure. This includes $70 million for Multi-Year communities from 2017-2020 and $10 million each year for three years to communities through the Municipal Capital Works program. These initiatives deliver on commitments in The Way Forward to strengthen the province’s economic foundation and deliver better services and better outcomes for residents. The Way Forward outlines all actions the Provincial Government is taking to achieve a strong, diversified province with a high standard of living, and can be viewed at thewayforward.gov.nl.ca.